As has been written in this space before (here and here), mortgage rates are currently being drivenÂ by inflation expectations.Â The Federal Reserve has been focused on supporting the economy by lowering short-term interest ratesÂ at the expense of the dollar, which is one cause of inflation (another major one being the huge demand for oil/energy in China). 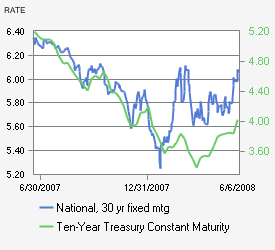 The graph on the left compares mortgage rates for 30 year fixed loans, in blue, to the rates for 10 year Treasury Bonds, in green.Â For the second half of 2007 and the beginning of 2008 they moved in lockstep. After a series of aggressive government actions in late January, and then the Bear Stearns “deal” in March,Â Wall Street finally realized that the Federal Reserve would continue to cut interest rates to support the economy.Â Whatever it takes.Â Thus inflation is a real concern.Â This can be seen in the chart as both theÂ blue and green lines find bottoms and beginning to increase (higher rates). AnÂ immediate question that jumped out at me: WhyÂ did mortgage rates jump even more thanÂ the Treasury rates in 2008?Â One factor at play is the difference in duration of the two loans.Â 30 year fixed mortgage rates are far more sensititve to inflation than 10 year Treasury bonds because they extend 20 years longer.Â I’d have to do some serious math to figure out how much of the impact can be explained by duration, so let’s just say that it is one factor and others are also possible. Last week there was an important shift in the government’s position.Â Ben Bernanke, Federal Reserve Chairman, said that the Federal Reserve Board is “attentive to the implications of changes in the value of the dollar for inflation and inflation expectations.”Â This is the first direct acknowledgement that inflation is of concern, and Wall Street intepreted the statement to mean that there will not be any more interest rate cuts. For us in the real estate market, Mr. Bernanke’s statement seems to have hurt more than helped.Â Wall Street has reacted by bidding up interest rates – they seem to be using his statement to support their fears that inflation could increase.Â Higher mortgage rates tend to hurt sellers as the purchasing power of buyers decreases. Few words are spoken with as much disdain as â€˜McMansion.â€™ Iâ€™ll admit to criticizing a property with the term on occasion, though Iâ€™m not one of those people who could wax poetic about the evils they represent. In fact, I recently discovered that I had trouble even defining the term while I was talking with a local builder/developer about a project in which he may participate. After mentioning the main value drivers in the finished home, like location, quality, location, price point, and location, I suggested that he make sure to differentiate the property from a McMansion. And thatâ€™s when I began to really think about the term. Wikipedia has an extensive page outlining all the characteristics (evils) of McMansions. Itâ€™s actually amusing that the tone of the entire piece is soÂ negative, all the way down to the final sentence and its snarky footnote. Articles and photo galleries have also taken McMansions to task. It seems to me that â€˜McMansionâ€™ is just another way to say â€˜new construction.â€™ Properties that wear the scarlet â€˜Mcâ€™ are purchased by folks who are interested in homes that have modern features and amenities. The 1,700 square foot, 3 bedroom, 1.5 bath colonial just isnâ€™t big enough for some people. And when choosing between 3,000 square foot homes, why not pick something brand new instead of something 100 years old if the prices are comparable? AÂ high percentage of new homes meet at least some criteria laid out in the various definitions of McMansions. Doesn’t that suggest that they are their own unique style? Would the West End of Hartford have been considered McMansions during the early 1900’s if the term existed?Â It’s full of starter castles that were built in former farmland at the edge of town with few mature trees. Perhaps weâ€™re seeing another example of our collective preference for historical artistic styles over current artistic styles.Â Maybe one day there will be a judgment-neutral term describing this style of architecture and even associations celebrating the structures. The good news for McMansion-haters is that thereâ€™s a good chance public sentiment (and their preferred architecture) is currentlyÂ changing dueÂ to reflect the rising energy prices. The internet is changing how real estate is bought and sold; see websites A, B and C. Consumers now have access to information they never had before. As more folks peer behind the curtain, real estate agents are going to suffer from fewer deals and lower commissions. The end is near! Although I agree with much of the standard template, there are usually two critical assumptions that get glossed over, resulting in a conclusion (real estate agents are the next dodo bird) that I disagree with. The first implicit assumption is that the only thing real estate agents do is match buyers and sellers. Thatâ€™s the most visible part, but thereâ€™s actually more to it than that. Weâ€™ll save that story for another day. The second implicit assumption is that real estate agents will ignore the internet revolution and cling to the status quo. Hopefully this blog is evidence enough that at least some agents are working hard to evolve their business to capture the best features of the internet. Recent history has provided two examples of service industries that have been reshaped by the internet; travel agencies and stock brokerages. Our family used to buy plane tickets through a travel agent â€“ there was no other option. Now, nearly everyone that I know uses the internet to book their own trips. Yet travel agents remain. Successful agencies seem to focus on corporate travel, where the agency is able to manage and report on the travel of a diverse group of people, or packaged trips and other value-added services that capitalize on an agentâ€™s unique knowledge. Travel agencies seemed at especially high risk for significant change because of the small transaction sizes, the relatively frequent purchases and the standardized products (all flights are basically the same). In a similar way, stock brokers used to be the only access point to the financial markets. The internet was able to open the investment world to dramatically more participants, and the industry evolved in response. Today, financial advisors focus more on providing strategy and advice and less on gathering data and executing transactions. One could argue that financial services firms have benefited greatly from the internet because they are now able to provide higher-margin services to a more sophisticated and knowledgeable set of clients. The real estate market will also evolve with technology, just like the travel agencies and stock brokerages. Despite the regular proclamations that the apocalypse is upon us, real estate agents will continue to play an important role for the foreseeable future. Buyers and sellers will continue to seek out professional advice forÂ their very large and infrequent transactions that involve a completely unique property. Like the NBC public service announcements, the more you know the better. Technology helps buyers and sellers know more about the markets and the process. Technology also helps agents stay on top of their markets more effectively. Most importantly, technology reduces busywork so that real estate agents can provide a higher level of service and advice, becoming more of an advisor throughout the transaction.Â As Michael Scott would be happy to report, it’s aÂ win, win, win! Once upon a time, Trinity College was located just across Bushnell Park from Downtown Hartford. 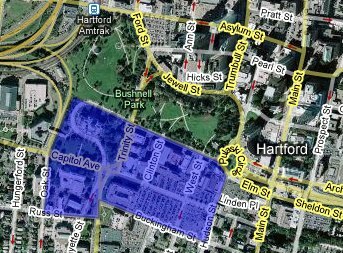 The college had a 10 acre (relatively small) campus that the City of Hartford offered to buy in 1872. The Trustees accepted, and moved the school to its present locationÂ in 1878. As a general rule, I try not toÂ second guess decisions that were made more than one hundred years ago.Â Eighty-six is my limit.Â Once you get toÂ one hundred, it just doesn’t seem productive.Â However, after spending a little time in and around the Yale campus this weekend, it seemed obvious that the hustle and bustle of students would be a tremendous addition to downtown Hartford. Suppose Trinity College were still downtown and occupied a campus represented by the blue figure, which is the original 10 acres and numerous adjacent lots. The Bushnell would be part of the campus. The vast parking lots would be replaced by academic buildings, dorms or athletic fields. Sure there would need to be some parking, but perhaps it would be tasteful garages rather than asphalt wastelands. Most importantly, there would be 2,240 full-time students to help support a vibrant residential community. Trinity isn’t moving back, of course. Fortunately, others have recognized the benefits of bringing students downtown and have been taking steps in the right direction. The UConn Business School opened the Financial Accelerator on Constitution Plaza. Capital Community College is in the G. Fox Building. There was even some student housing built in conjunction with the redevelopment of the Sage Allen building. Someone recently wrote a letter to the editor of the Courant that UConn should move some of their schools downtown (sorry, couldn’t find the link).